While no one is structurally perfect, there is a normal healthy range. In the same manner, we can understand what a fever is because we know what the normal temperature is, or what constitutes high blood pressure because we are aware of the normal range. There are established normals everywhere we look, including gauges and warning indicators on the dashboard of your car, letting you know when things are abnormal. At Northside Chiropractic, we are looking for a significant three-dimensional shift of the spine away from normal. If the head and neck shifts in 3 directions, it will cause the shoulders to twist, and the hips to shift forcing the entire spine out of alignment. These shifts cause the muscles to spasm, the ligaments to deform, and disrupt the nerves traveling down the spinal cord. 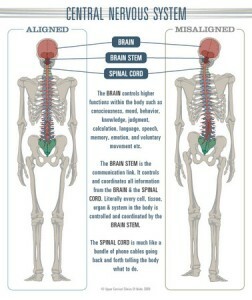 In other words, the main communication system that connects your brain to your body can be disrupted. 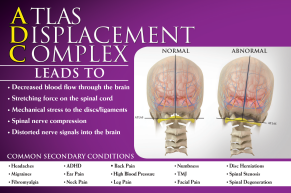 The Primary Condition that we work with is called the ATLAS DISPLACEMENT COMPLEX or commonly known as Atlas Subluxation. Once a neural shift is present and disrupting the spinal nerves and spinal cord, it can create many different secondary conditions or symptoms. The reason these are called secondary conditions is because they are a result of the primary neural shift, or the underlying cause. The location of the Structural Shift and where the nerves are being disrupted will give us an idea about your secondary conditions. Contact our Creston office today to learn more, or if you have any questions. We look forward to discovering how we can help you!